Here it is Friday already. Tomorrow is the drawing on the Row House! Many have stated their choice, and many are correct...many are wrong, but consistent! I used "Collections" houses, vintage photo and stamps. 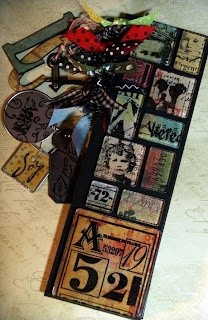 Tim Holtz doo dads and Distress Inks. The little face is from Artgirlz stamps. Cool girl! I had shades like that in the '70's and freckles, too. Keep guessing. Not feeling so well today....maybe a touch of the flu...trying to stay away from DH. That's the last thing he needs! So, playing a bit with the Grungeboard. One stamp from Stampers Anonymous for the background. I used Brilliance inks on the pieces and embossed with Distress Powders. Still needed more color, so I dug out the Lumiere paints and added some Russet here and there. The star is from Maya Road. Back of a snap at the top, a charm, and rusty wire completes the look. A bit over the top for me, but it was fun. Trying out some Grungeboard and a 6x6 canvas board. Painted the letters with Adirondack Acrylics Pesto, stamped, layered on Titan Buff Golden Acrylic paint,then dulled down with Black Soot Distress Ink. The background paper is from The Paper Element Coffee: Cream & Sugar. I HAD to use Distress ink on the paper, of course, but the papers are beautiful! Added a few stamps and my pen work to the edges. Done! Background stamp on letters is by Great Impressions, vine and scroll are by Printworks. Numbers are unknown. The small print background stamp is Paper Artsy. The SWAPS arrived today from Australia!!!! WHOO! WHOO! Greta did a terrific job of coordinating this thing. The first is the puzzle swap. I had no idea they made such large puzzle pieces....duh....I guess the purpose is so one can decorate them!! Then the houses!!!! Need I say more. They are from mostly Australian Artists, but a few of us are from the US. Aren't these just to die for?!?!??! I must make a backboard so I can put th em across my bookcase. So fun to look at....bet you can't guess which one is mine. Here's a thought that just came to me. Guess which one is mine, I'll take the all the correct answers next Saturday, and draw from a hat for one on my little houses as a prize!!! Most of these are made with JVO's "Collections" chipboard houses. But some are cut from mat board. I didn't have my shipment from her, so I just cut out my own. They all seem to work well together, don't you think? Ok, Wendy is running a great idea for comments on what everyone likes to see in a class teacher. Jump to her blog and put up a comment!! We will be down in St.Louis at For Keep Sakes the end of March....as if we haven't already let you know! I am going to work on door prizes for the class today. What do you guys think of THAT idea????? Looks like they closed the shop because of ICE today!!!! WHOA!!! Pictures to follow later today of some of the prizes....shall we have a drawing every once in awhile...or what? Add a comment with your thoughts! Just added the 1st in the door prizes..a mini house from "Collections." Love her houses and her stamp s....let me know what you think here!!! Here's house number 2 for the door prize!! It's a bit bigger. Can anyone figure out what the key is made of, and what it has on it to make it look really old? It really turned out pretty cool! Becky was right...it's Grungeboard and Distress Powder over paint. FUN, FUN, FUN to work with!!!! Tim is a genius!! And here's House No. 3!!! This is a transparency in one of Julie's houses. It is of my brother-in-law when he was about 3...according to lore! Ha! That's all for today. Must go feed the hungry husband. May do another one later tonight...you never know!! You Make My Day Award! Well, DH is home from hospital, and resting well with his pain meds. He had double hernia surgery yesterday and is SOOOOO glad to have that overwith!!! Thank you to ALL who checked in, they took great care of him. I could have done without the before and after picture Dr. David was so thrilled to show me...ewww...all I wanted to know was that he was OK, and he just wanted to show me these pictures...cause he already KNEW he was alright!!! Gotta love 'em! Anyway, my good friend Lori Roberts at Altered Arts Expressions blog, awarded me with You Make My Day Award,for being an inspirational blog! What a sweetheart!!!! The rules for the “You Make My Day” award are to re-present it to 10 people whose blogs bring you happiness and inspiration and make you feel happy about blog land. Let them know through email or by posting a comment on their blog so they can pass it on. Beware you may get the award several times, and if you do, consider yourself really, really loved.So to pass it on and keep the love going ~ here are 10 of the 100's of blogs that keep me inspired and bring a smile to my face. Check them out when you have a few minutes... perhaps there are some new friends to be made! 1. 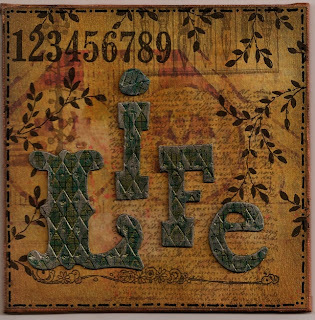 Wendy Vecchi---What a great friend and inspiration. We both love black and brown! Paper and stamps are our life! 2. Jen Crossley A Mark in Time...SOOOO love her work!!! 3. Shirley McCutcheon- Undescribable beauty and tutorials! 4. Kelsey from Australia. Terrific stuff here! 5. Rachel Greig...a warm a wonderful person of many talents! To die for photos!!! 6. Greta..Oz in the Fast Lane...another wonderfully gifted and generous Australian gal. 7. Kim Logan Art Alchemy...beautiful, stunning images! 8. Rande Hanson- collages galore! Fabulous!! 9. Tim..."the one and only!" 10. Julie vanOosten..Nirvana..really got my chipboard addiction started! That was a lot of work, hard to narrow it down, but I've been so blessed with finding all these people, and their works, that I can't even put it into words! Everyone is fabulously talented and they all love to share! Thanks Lori, you know how I feel about you!!!! The class for Mar. 30th at For Keep Sakes has a bit of a change. The Sketch book has been discontinued, and so we had to go looking for another book to add our little Fragments to. And here it is!!!! The 7Gypsies tag book!!! It's a bit larger, with tag shaped pages, and it still has between 11 and 12 Fragments that will fit on the front. 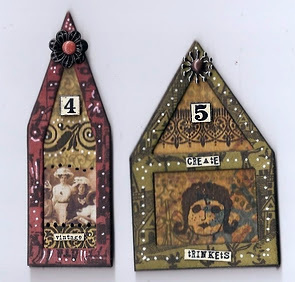 These are made with just scraps of paper from other projects, and lots of "junk" hanging on the spine....Grungeboard, chipboard, wooden letters, beads, and other surprises. Plenty of Stampers Anonymous stamps here. The baby is by Endless Creations, and ART by Hampton Art.Altered is by Stamping Sensations and the star is from Collections. Then to fill in, I added dots!!! Lots of white accents to contrast with the dark distress ink. Lots of tips and techniques to be in this fun class. Here's a sneak peak....(don't you think THAT phrase is getting a little bit overused lately)....of the book that I'll be teaching Feb. 23rd at Scrapbook Friend'z. It is so cute!! I thought it was much bigger than it really is, so that makes it harder for me. Smaller is not easier. This is the inside papers before they were glued. The only way to photo it since afterward the pages are in the way. Brilliant, aren't I....you can't fool me!!!! This is made with Basic Grey LilyKate papers, and a Melissa Frances book. The flower stamps are Impression Obsessions, the Florishes by Autumn Leaves, and the dots by Savvy Stamps. Those who know me know I'm not a glitter person, but the new Texture Rubbing - borders by 7Gypsies really amazed me. The fine detail they have is beautiful. I'm glad I tried them, and as you can see, they are addictive. After you use one row, you have to keep using JUST one more for balance ....yeh ....right. Here it is all put together. And yes, it has been changed!!! Added some words! Hope the girls will like it! This is another one of my favorite images that I used in my little book that's at CHA without me....lonely I suppose. My friend, and the other part of the newly dubbed "Dynamic Duo" is there to watch over her. I KNOW Wendy is going to have the time of her life!!!!! So well deserved!!!! She works sooooooo hard! Anyway this was done by using a paint dabber background of white and stamping over with Memories ink. I have never had a problem using this ink on acrylic paint....so that's what I use. There are more of the miniMarks in the background. I love these. The Bloomington Shop, Scrapbook Friend'z, was the 1st place I saw these, but they have no web address on them, so I can't give you a link. Sorry. But they have great designs. Stampers Anonymous, my fav, created the stamp. Isn't she wonderful????? Wordy Woman is what I believe she's called. That's it for today....too many projects are calling my name and driving me crazy. The sun was shining so nicely this morning it was hard to drag myself out of the sunroom and into the studio to work, so I'll have to burn the midnight oil to get anything accomplished! Me and the owls! It all started when Nancy from For Keep Sakes sent an email asking about my Row House class. She asked if I could teach the class in St. Louis. Well, I was REALLY thrilled, but a bit apprehensive about the distance...it's 3 hours to their shop!! And this place will soon be 6500 sq. ft. of STORE! So, being the big chicken that I am, I said "and my friend Wendy is a Ranger U instructor, and you might be interested in her teaching there, too!" The rest is history. Wendy is teaching her Techniques class in Ranger style Saturday, then comes my Row Houses class in the PM. Sunday I go first with the Fragments book, (the back is shown above) and Wendy brings it on home with her great new project using stamped Grungeboard and glass that's secret...REALLY cool! You do NOT want to miss this!!! Here is the 2nd page of the Maya Road Rage book going to CHA.....without me. Oh well. Can't have everything. Ever have a thunder and lightning storm in February? My son thought a plane had crashed...it was LOUD! Then just 5 minutes before the Super Bowl game is to start, WE LOST POWER???? Not good...it came back at half-time, but we lost it again and again. The last time I had just put the Glossy Accents on my largest piece of Fragments and it was not settled!!! Geez!!! Trying to get downstairs to the kitchen where the flashlights and candles were, in the dark...then run back upstairs to straighten the little piece before it dries!!!! Soooo, this is what I did when the lights were on. A 7Gypsies book, papers from Basic Grey Recess tablet, stamps are Stampers Anonymous Tim Holtz Collection and one from Endless Creations...the little guy at the top right. 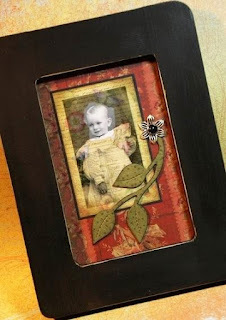 Altered, Artist, and Joy are by StampingSensations. Some of the papers were distressed with inks, but most were just the look of the great papers. Chipboard letters are from K&Company. Anyway, the game was a great one...no matter who you were for, and I got to play..off and on...like the lights! Let me know what you think of the Fragments! AREN'T THEY SOMETHIN"? They were VERY easy to work with, and using the Glossy Accents makes the black ink even darker, which I REALLY loved. The Class was a BLAST! Great class, they all used different papers, and it worked out. It REALLY had my mind working overtime to figure out how their different papers would be cut to get the effect they each wanted!!!! Seven different designs. WOW...but boy, did they ALL turn out wonderful!!! I was so proud of all of them. It just goes to show you, that whatever someone picks, it will be beautiful in it's own way. We had pink and blue, brown and green, multi-colored floral, stamped and unstamped. I remembered to take my camera, but did NOT remember to take a picture.....what can I say. DUH! And thank Heavens, my book got there in OK condition. Came home to an email from Lisa that all was well.... Picked up another home-cooked meal on the way home (Papa Murphy's Pizza) and called it a day. Hey, I BAKED it! What more can a girl ask for in one day!!! Our lovely little town got at least 9 inches of snow, according to the local weather service. All you have to do is set me up to teach a class, and we get an ice storm, or lots and lots of snow. It happens!!!! I am not kidding. I'm teaching a class tomorrow, so we get tons of snow!!! So, to while away the day, I decided to try another transparency of one of my favorite vintage baby cabinet cards. Believe it or not, it turned out well, I think. The background paper really made it! And not one stamp....except some dots on the leaves. I used Peeled Paint and Vintage Photo Distress Inks. Some Mahogany and Peeled Paint on the lighter background paper gave it a nice contrast for the edge. Papers by K&Company.